George Mann (Writer), Alan Quah (Artist). +Nice little references to the games. -Struggles to relate to the source material. It's an ok fantasy comic. But Dark Souls it ain't. 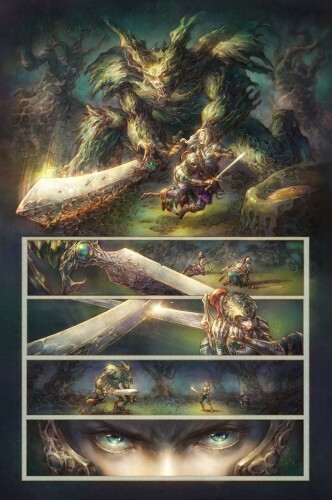 Dark Souls: Breath of Andolus is Titan Comics latest licensed offering written by George Mann with artwork by Alan Quah. It’s a solid romp but it struggles with capturing the essence of the source material. When I found out that Dark Souls was getting a comic book, I have to say my interest was piqued. Firstly due to my love of the games and secondly because I wondered how it was going to work. To clarify my second point, for me and many others one of the big attractions of the Souls series is that the narrative is given to you piecemeal. It is open to interpretation and serves to provide the world that you play in with an atmosphere all its own. I’m not one to go into the specifics of the plot and I won’t. All I have to say is that the comic’s story seems in the vein of more traditional fantasy fare than the dark, brooding, almost horror like narrative of the games. However, the book does provide the reader with some touchstones that they will be familiar with from the Souls franchise. The story opens with the protagonist Fira resting by one of the bonfires that are dotted about the Souls world. There is also a cameo by one of Dark Souls‘ most loved and memed characters; although he doesn’t display his usual “sunny” disposition. These are fine nods to the source material and I’m sure there will be more of this sort of thing later on in the series. The artwork, like the plot and overall narrative feel, struggles to capture the Dark Souls aesthetic. Once again, it looks great and if this was an original straight fantasy comic I feel I wouldn’t be making these comparisons. The colour is too vivid and Fira’s armour is too shiny. When I think of Dark Souls I think of muted colours, weather beaten equipment and decrepit and ruined environments. Overall, Dark Souls Issue 1 is an ok time. It seems to stick to close to the generic conventions of traditional fantasy comic storytelling and art style. This is disappointing, because it seems that perhaps they have not taken the chance to adopt the source materials unique narrative structure, muted grandeur and foreboding atmosphere. Remember, however, that this is only issue 1, this series has all the time in the world to evolve.